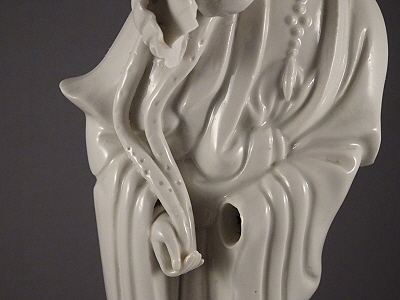 Guanyin is one of those figures who has crossed boundaries - in more ways than one. She began in India as a male, Buddhist enlightened teacher, The Bodhisattva of Compassion, Avalokitesvara. His cult crossed to China, where it merged with local traditions of a suffering goddess of mercy, who hears all the woes of the world. Her similarities to other compassionate goddesses worldwide, and not least to the Christian Mary, Mother of God, have made Her well-known globally. Here, Her right hand is raised in a posture similar to (but not the same as) the mudra for Fire or that for Air. In her left hand, she holds a ruyi sceptre, based on a lotus flower and stem, symbolising the fulfilment of the heart's desire or the granting of wishes. 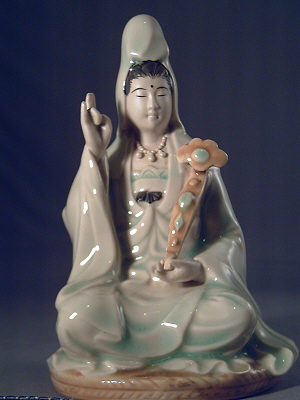 This simple earthenware figurine is mostly glazed in celadon green and brown, but her hands, chest, face and hair remain unglazed. The facial features and hair are highlighted in black paint. Place: Unattributed, but probably made in China; collected in Lowestoft. The left hand and the ruyi in the first example are attached separately. 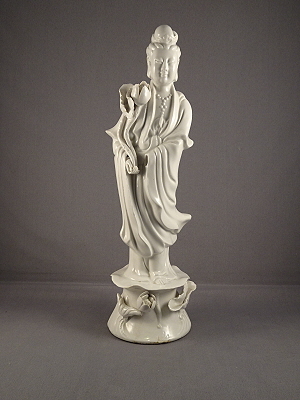 Some Guanyin figures, as with this porcelain example, actually have left hands that are meant to be detached (and here is in fact missing). The idea is that the hand is removed, a wish made, and the hand replaced when the wish has been fulfilled. Place: Made in China; collected in Norwich. This site and its contents, unless otherwise stated, are copyright © Chris Wood and Val Thomas, 2018.